Pfost, M., Hattie, J., Dörfler, T., & Artelt, C. (2014). Individual differences in reading development: A review of 25 years of empirical research on Matthew effects in reading. Review of Educational Research, 84, 203–244. Young children arrive for their first day of kindergarten with varying degrees of prereading and reading skills. Some kindergartners recognize letters, some know a number of phonemes, and some can decode words or even read fluently; other children have none of these skills. Large-scale research on children in many different countries shows that even in later school grades, there are vast individual differences in reading proficiency. One explanation for the continuing gap in children's reading ability is known as the "Matthew effect." The name is taken from a statement in the Parable of the Talents in the Gospel of Matthew that is often paraphrased as "The rich get richer, and the poor get poorer." Applied to learning to read, the Matthew effect theorizes that children who start with a high level of reading proficiency grow in their reading ability at a faster rate than children who start with a low level of reading proficiency, resulting in a widening gap over time between the two groups. The underlying mechanism for this effect is believed to be one of motivation and reading experience. Good readers are motivated to read; poor readers are not. As a result, good readers gain more reading experience over time than poor readers, leading to development of a broader vocabulary and better reading comprehension, which compounds the difference in reading proficiency. In contrast, two other theories concerning the development of reading skills expect that individual differences in reading will disappear over time. The compensatory model theorizes that young children with poor reading skills will catch up to their peers. These "late starters" will grow at a faster rate than children who developed reading skills earlier in life. Another theory, the delayed compensation or developmental-lag model, is most evident in prereading skills where a finite amount of knowledge can be gained, such as learning the alphabet. Children who already recognize at least some letters will likely learn to name all of the letters quickly upon starting school, and those who do not recognize any letters at the start of school will lag behind, gaining proficiency in letter naming more slowly. Over time, however, they will master letter naming at the same level of ability as their peers. Similar reading skills that have finite limits on the knowledge to be acquired, such as phonics, also would be expected to show the delayed compensation pattern of development. Skills with higher ceilings on growth, like vocabulary knowledge, would be less likely to show this pattern of development, as the early readers will continue to grow in these skills. Longitudinal studies follow children over multiple time points. To assess the extent to which the Matthew effect, compensatory model, and/or developmental-lag models accurately describe young children's pattern of growth in reading skills, multiple studies have used a longitudinal design. Pfost, Hattie, Dörfler, and Artelt (2014) synthesized these studies to determine which pattern predominates and under what types of conditions each is most likely to be observed. The focus of their synthesis was to determine whether children who begin school with different levels of reading skills have different growth trajectories. They included only studies that (a) focused on students in grades 1 to 6 (ages 5–11); (b) had at least two measurement points; (c) measured one or more reading skills; (d) reported sufficient data to determine whether the Matthew effect was evident; and (e) included only students in regular education classrooms who did not have a diagnosis of dyslexia or other psychiatric illness. In total, 28 studies reporting 78 distinct results were included in Pfost et al. 's report. These studies included those conducted in the United States and abroad; in all, approximately half of the samples were English-speaking. 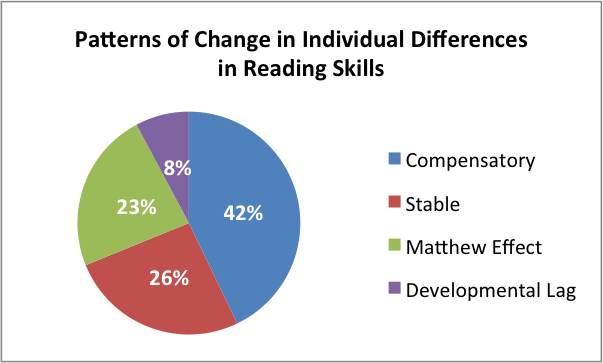 The results of the analyses from each study were classified as showing one of four developmental patterns: a Matthew effect, a compensatory effect, a developmental-lag effect, or a stable pattern of differences in reading proficiency. The chart at right shows the percentage of the 78 results that provided evidence for each pattern of growth. The compensatory pattern (differences between readers decreasing over time) was seen most often, but the differences in the frequencies were not statistically significant. To investigate these effects in more detail, Pfost et al. also looked at the role of moderator variables to understand the conditions and factors related to the presence of each pattern. Reading skill measured. Measures of decoding speed and efficiency were more likely to show the Matthew effect or a stable pattern of differences than to show a compensatory pattern. Measures of decoding accuracy most often showed stable and compensatory patterns of differences. Too few results from studies of vocabulary and reading comprehension were available to draw any conclusions about patterns of differences on these reading skills. Participant characteristics. The developmental-lag pattern was seen most often in studies involving younger children, but there were too few studies with this pattern to draw a firm conclusion. Measurement properties. Results indicated that measures of reading skills affected by floor and ceiling effects showed decreasing patterns of differences much more often than measures without these limitations. Floor effects typically indicate that the measure is too difficult for the children taking it; ceiling effects typically indicate either that the measure is too easy or that the skill being tested is constrained by an inherent limit in the ability needed to achieve a perfect score. Pfost et al. also used a measurement quality indicator to investigate its role in influencing which pattern of differences was found. Less precise measures most often provided evidence for decreasing achievement differences, whereas more precise measures tended to show stable patterns of differences or the Matthew effect. One possible reason for this finding is regression to the mean, which would result in high and low scores moving toward the average over time. Regression to the mean is especially evident in less precise measures. Based on their review of the research literature, Pfost et al. conclude that there is no support for any particular developmental pattern across all reading skills. Their findings imply that children who begin school without any reading or prereading skills are not doomed to be poor readers forever—it is possible for them to catch up to peers who start ahead of them. In particular, children can gain considerable ground on skills with natural limits on mastery, such as letter naming and phonics. This finding further underscores the importance of early intervention in helping young children who begin school without letter or phonemic awareness skills to master these prereading skills quickly, so that they are not at a disadvantage in learning to read and comprehend text. Pfost et al. excluded from their review any studies that included children diagnosed with dyslexia. Further research is needed on the prevalence of the Matthew effect with this population. Additionally, research on the impact of intervention on growth rates for both children with dyslexia and poor readers without dyslexia is needed to determine the extent to which intervention affects the achievement gap between good and poor readers over time. For researchers, the implications of Pfost et al. 's review also point to the importance of precision in measuring reading skills in longitudinal studies. Measures with high reliability and without floor and ceiling effects must be used in these studies to determine whether the Matthew effect accurately describes the pattern of reading proficiency differences between children who start with low reading skills and children who start with high reading skills. In addition to using precise measures, Pfost et al. recommend that researchers collect data at three time points or more and document any factors that may relate to differing growth rates over time for good and poor early readers.